Leonard Long was an Australian painter of the Australian School of landscape painters. The Bluff, Braidwood North, N.S.W. Leonard Hugh Long OAM (25 April 1911 – 3 November 2013) was an Australian painter of the Australian School of landscape painters. Born in 1911, Leonard Long was a landscape painter in oils of the Australian School. 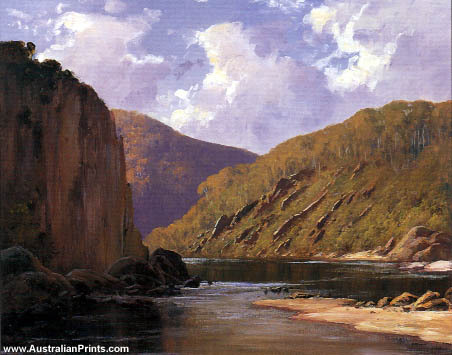 Long was raised in Mittagong on the tablelands of NSW and it was here that he developed his love of the Australian landscape. In 1934, he and his wife settled in Nowra where he gradually developed his talent as an artist. In 1955 he sold is watch-making business and became a full-time painter. Leonard travelled extensively throughout Australia on his many painting and sketching trips, and also made several painting trips overseas. He has had many successful one-man shows in all capital cities and many provincial centres throughout Australia. His work is represented in many gallery collections both here and overseas. Artist information page for Leonard Long. This article uses material from the Wikipedia article Leonard Long, which is released under the Creative Commons Attribution-Share-Alike License 3.0.